Iraqi officials say they have arrested a key al-Qaeda member for the bombing of a revered Shia shrine in Samarra. National security adviser Mowaffaq Al-Rubaie said the man, a Tunisian identified as Abu Qudama, was one of seven men wanted for the attack. The bombing of the al-Askari shrine in February led to a sharp rise in sectarian attacks across the country. Mr Rubaie said Abu Qudama had been arrested several days ago and had confessed to his involvement. At a news conference in Baghdad, Mr Rubaie said the attack had been masterminded by an Iraqi, Haitham Al-Badri, who was still at large. The seven wanted men - all al-Qaeda members - also included another Iraqi, and four Saudi nationals, he added. Abu Qudama was wounded in clashes several days ago with security forces north of Baghdad, in which 15 other foreign militants were killed, Mr Rubaie said. 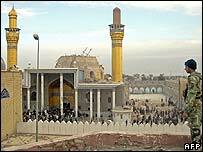 The bombing led to reprisal attacks on Sunni shrines, and a rise in sectarian violence led to the deaths of hundreds of civilians.